This one is not purely related to Truly Rich Club review. It's about a man I also admire with regards to investing, financial freedom and money matters. His name is Rex Mendoza. I first heard about him from Bo Sanchez. Thanks indeed to Bro. Bo. Rex Mendoza is the current CEO of one of the leading insurance firm in the Philippines. I haven't meet him yet, elbow to elbow (...soon). I just saw him from YouTube. Last two weeks ago, February 11, through the Truly Rich Club, Bro Bo, sent an email to us and mentioned about Rex Mendoza. 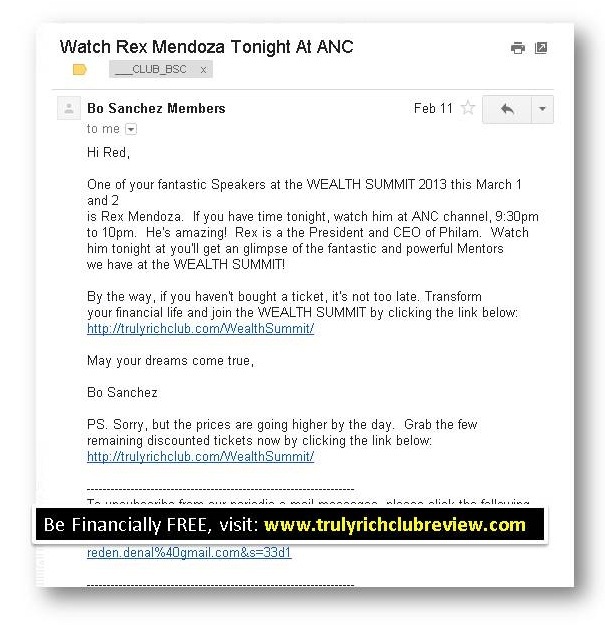 Bro Bo said that in the first ever Truly Rich Club Wealth Summit On March 1 and 2, 2013, one of the fantastic speakers is Rex Mendoza. He told us to watch him on TV via ANC. Unfortunately, I forgot to watch him on ANC. But that's OK.
We're lucky. It's now uploaded in YouTube and I am also sharing the video here below. Please watch. HIGHLY RECOMMENDED. Instead of watching non-sense video via YouTube, watch this NOW, and learn from this money expert. If you like this video, please share your comment below this blog. Here's another news from abs-cbnnews.com about Rex Mendoza. Please also read. He simply "took the plunge." Rex Mendoza, who entered Philam Life as a managerial trainee before coveting an executive position, shocked his peers when he resigned to become an insurance agent. "I was about to be promoted to a very senior position when I resigned to be an agent," Mendoza, Philam Life's president and chief executive officer since 2011, told ANC's Pipol. The income was probably one of the lures that led him to make the decision, but Mendoza said it was more of seeing the agents really having a good time and enjoying the challenge their jobs posed. "Earning variable income is really in direct function of effort. So I really felt, if they can do that then I'll probably be able to that too," Mendoza said. "I took the plunge and frankly, I did very, very well," he quipped with a smile. During his first year as an agent, Mendoza garnered awards at the company, including being a Million Dollar Round Table member, a recognition of excellence in sales. "When I left the executive corps, I wanted a game for myself. I wanted to be my own boss," Mendoza stressed. He related choosing a career path far from what his parents wanted compelled him to do his best. "I had to be good at it. I didn't have a fall back position... My capital is myself, my capability," Mendoza said. Wanna learn more about FINANCIAL FREEDOM?